People often ask me when is a good time to visit Ambergris Caye.Â One of my favorite events is the Lobster Fest, which takes place in late June.Â Lobster season opens on June 15.Â FestivitiesÂ start soon after.Â This year the Lobster Fest Week will be June 19th -25th.Â Â A week of lobster related celebrations culminates with a block party that is held on Saturday night, June 25th, at the town square.Â This is an event worth attending! In 2009 Grand Baymen scheduled a Chill Weekend to coordinate with the Lobster Fest.Â It was such a hit with our visitors, that ever since we'veÂ planned a Chill Weekend during the Lobster Fest.Â Normally our group Saturday night dinner is held at one of the better local restaurants.Â But during the Lobster Fest, we take the entire Chill Weekend group into town for the Lobster Fest block party.Â It'sÂ always a group favorite...Â And everyone gets their fill of delectable lobster dishes. 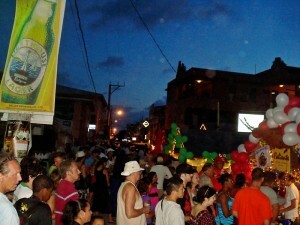 Â As expected, the 2010 San Pedro Town Lobster Fest was a grand success. 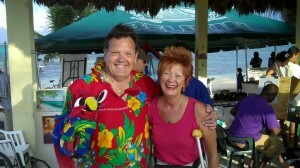 Traveling Caribbean One weatherman, Joey Stevens, joined in for a week of events dedicated to celebrating the reopening of the lobster season.Â His presence gave our Isla Bonita an extra boost in international media exposure.Â Caribbean One/WSEE airs in 33 countries, in the Caribbean and parts of the USAÂs East Coast.Â WSEE is a CBS affiliate, headquartered in Erie, Pennsylvania. Each year the San Pedro Business Association goes all out to organize a bigger and better Lobster Fest.Â This year they came together and donated the necessary funds needed to sponsor Joey Stevens as a special guest judge for the Lobster dish competition.Â As a result, the media coverage we received due to the presence of Caribbean One is expected to assure the success of Lobster Fest 2011. Actual activities kicked off on Monday,Â the day before the opening of Lobster Season.Â Â Â Every night a special event was held at a different venue.Â Joey Stevens participated in each one,Â camera-man in tow.Â Â They filmed at locations all around Ambergris Caye and Belize.Â The film clips started airing in mid-July and should run for at least a month on Caribbean One TV. 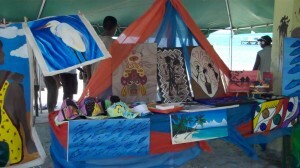 Â They were all on display.Â The artists were present, meeting and greeting visitors.Â The CaribbeanÂs aqua blue waves lapped at the beach behind the artists displays. What a perfect back drop for the splashy exhibit of local creativity. The ultimate event is always the Saturday night block party.Â By Saturday, we were all salivating in anticipation of trying this yearÂs entries for the best lobster dish competition.Â Since I was still mainly confined to my wheelchair, Mike and I came early, to beat the crowds.Â Good thing!Â By 6 PM the food booth lines were long, and the crowd growing. The Mojito Bar & GrillÂs Lobster Salad Tostada walked away with first prize.Â The Hurricane BarÂs Lobster Creole came in second.Â Unfortunately, Mike and I were already full before we had a chance to try either of these winning entries.Â Blue Water GrillÂs Mango Lobster Colada took first prize in the drink competition. It wouldnÂt be a festival without entertainment.Â A buzz ensued as the sun went down and our favorite local fire dancer, Lara Goldman, worked her dazzling magic right there in the town square.Â The San Pedro Dance Company later performed on the stage.Â A Lobster Queen and King were chosen and crowned.Â And the final act was the popular Belizean performer, Supa G.